Many Network monitoring applications are provided total network bandwidth to the user. But, if you use NetLimiter, it will give you the bandwidth usage of each application separately.For example, when you use Chrome browser and Firefox browser, you can find the how much bandwidth use by chrome and how much bandwidth use by Firefox. Therefore, user can realize how much bandwidth consume by specific application which run on the PC. Also, you can get download speed and upload speed of a specific application (like Chrome). 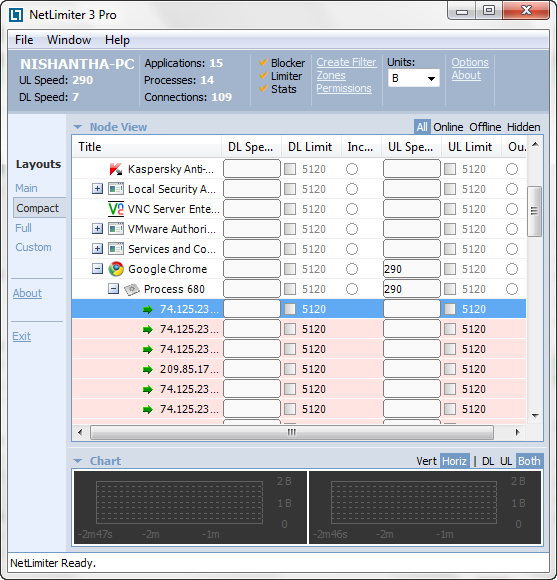 On the other hand, NetLimiter can be used for limit your internet or network bandwidth for specific application. Now, i will discuss about how to limit the bandwidth for a specific process using NetLimiter. In the DL Limit column, you will see a number which is actualy 5120 by default, Click on that number so that it will open a window. So, change the value to desired speed that you need to limit and press save button. 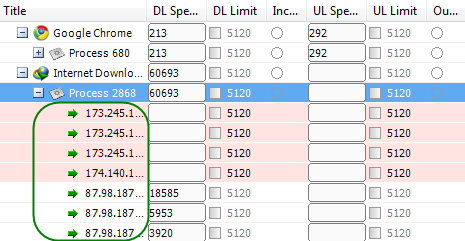 When you put a tick in front of the value that you changed, NetLimiter begins to limit the bandwidth for desired speed. Check two of below figures, so that you can understand that the procedure and realize the speed difference. You can also set Firewall Actions by simply clicking on the small circle located next to the 5120 value. NOTE: If you using Kaspersky Internet Security on your computer, probably all the traffic go through that. So, NetLimiter may be shows all tha traffic under the kaspersky processes.